The importance of packaging and related industries will take centre stage next week at Africa’s ultimate packaging, food processing, plastics, printing and labelling trade exhibition, which will afford over 600 exhibitors the opportunity to showcase their latest technologies and innovations. “Packaged products on retail shelves are largely as a result of the collective food processing, packaging, plastics, print and labeling industries which is why it’s so important to showcase these industries together,” says Sven Smit, Propak Africa’s event director. 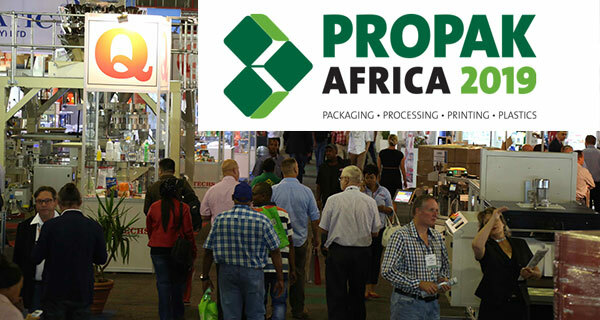 Propak Africa is ideally positioned for visitors to source latest industry information, speak to technical experts, and view interactive product displays and live demonstrations. Several new initiatives have been included this year to add further visitor value, including an “every day a themed day” experience and free-to-attend seminars. “We are really excited about our new free-to-attend seminars which will be taking place daily in Hall 7,” says Smit. “Over 20 speakers will address important industry issues and share their knowledge and expertise. Pyrotec PackMark will be showcasing fully-integrated operational coding and labelling equipment using PackLink, a customised product tracking system. Visitors will see the Anser U2 mobile hand-held printer and the 9405 CIJ coder from Markem-Imaje. Pyrotec PackMedia’s visitors will witness a South African first – the unveiling of a ground-breaking new machine. Live demos of laser coding systems as well as non-toxic, UV visible and invisible edible ink will take place at the TracePack stand. Developed to control the traceability of food products, this ensures the control of the products from their origin to the shops. Automation Techniques will be showcasing the latest technology in inspection and packaging machinery for the food, beverage and pharmaceutical industry. Expect to see the latest innovation in X-ray technology, and coding and marking printers for the FMCG and packaging industry. The latest advances in inspection systems, such as metal detection and check-weighing systems will be demonstrated at Propak Africa by Detection Techniques, a sister company to Automation Techniques. Butcher and Meat Processing Equipment (BMPE), a supplier of quality new and refurbished food processing equipment has been appointed as the new agents for Kolbe Foodtec (Germany). The Kolbe Bandsaw and Mixer Grinder will be on view. They will also be introducing the latest Radio Frequency Technology by Stalam, making defrosting efficient, faster and profitable. Whether mayonnaise, ketchup, hummus, tzatziki, rice, pasta, sushi, sandwiches, sauces, vegetables, meat, fish; even plankton. GS Italia designs and manufactures machines and lines for every type of product: from production and cooking, up to dosing and packaging. It will have a GR650 depositor on the stand for sale and also for demonstrating metered dosing throughout the show. DC Norris will be showcasing its JetCook steam infusion technology, which recently won the Gulfood Manufacturing’s Top Futuristic Technology Award. Stuart Rigby, DC Norris Steam Infusion expert, will be on their stand. With over 13 years and 4,200 trials on steam infusion under his belt, he can advise visitors on how JetCook Steam Infusion can increase performance, quality and profitability in food factories. Trempack will be running live demos of the latest, bestselling Smipack shrink wrapping machinery for the SA market, using Bolphane Shrink films with a wide range of interesting applications, notably in fresh produce. Also in the fresh space, the Proseal GTR/GASS tray-sealer will be on live demo, highlighting the reduction in environmental impact by using film vs tray lids for sealing punnets. In addition to the seminars, four conferences will be taking place alongside Propak Africa, providing additional learning opportunities for visitors. The Institute of Packaging SA (IPSA) Think Tank will take place on 12 and 13 March, the Printing SA and South African Institute of Printing (SAIP) Conference will take place on 13 March and the SAPRO and WWF-SA Design for Recycling Workshop will take place on 13 March. VDS Media’s Propak Africa Packaging Innovation and Sustainability Conference will take place on 14 March.